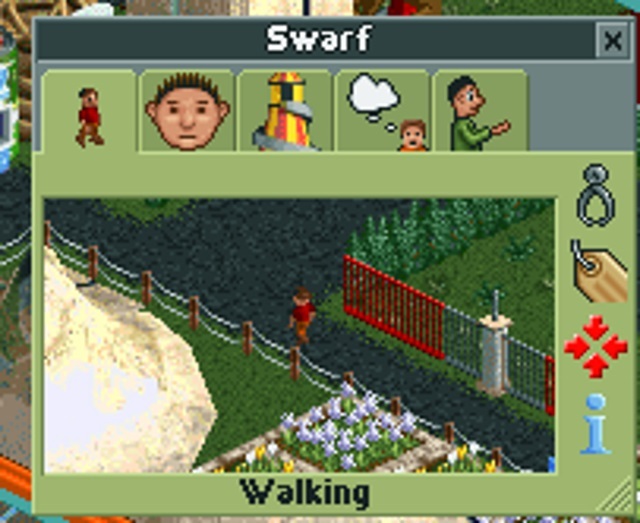 I don't think that would work, due to the custom assets being used in the game. 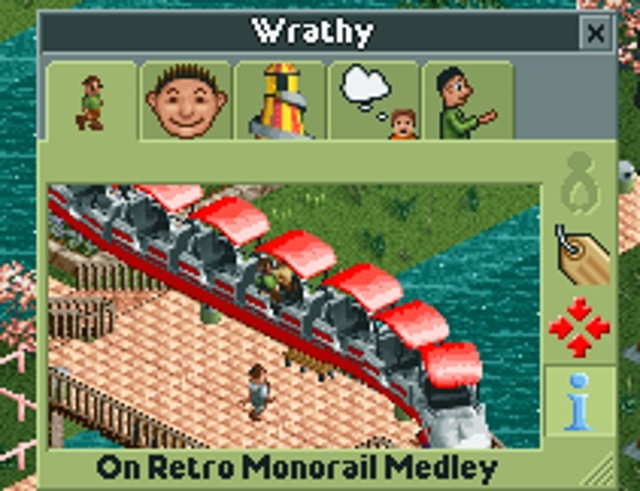 I'll climb aboard that hype train .. 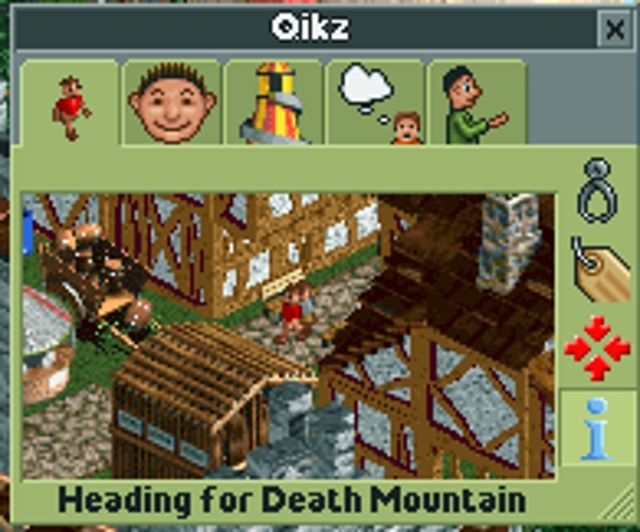 I love the place especially with the fact that it has a DK Mine Cart. 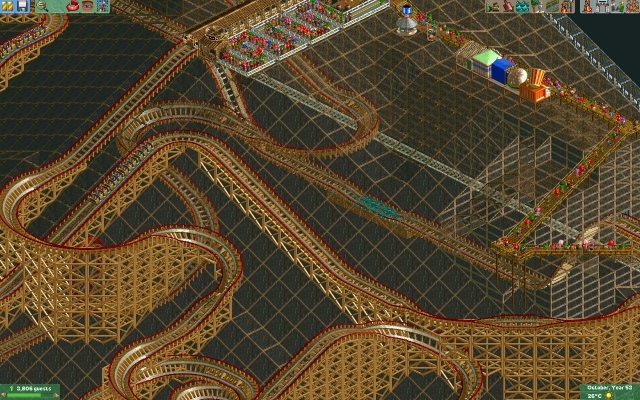 Although that said the feeling of racing another coaster isn't something that real life designers have explored. 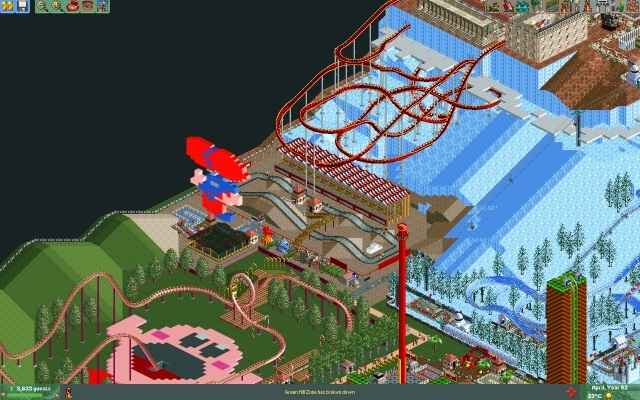 The ride of the park is The Big Blue surely.. For me I also love and therefore give second place to Rainbow Road. 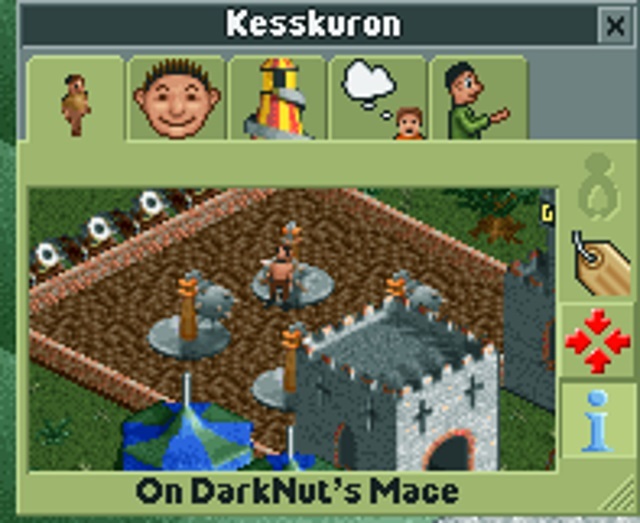 One thing I notice on my look throughs is that the DK sign at the start of one of my favourite areas is hidden by trees. I feel it would enhance that area to either find a way of repositioning the trees, getting the axe out to a few of them or increasing the size of the sign. Just a thought and probably only because I love DK. Can't wait to see what happens next anyways. Welcome to NES Corner! Just a little faithful nod to Nintendo's early history, with a couple of games that are still incredibly under-represented nowadays. 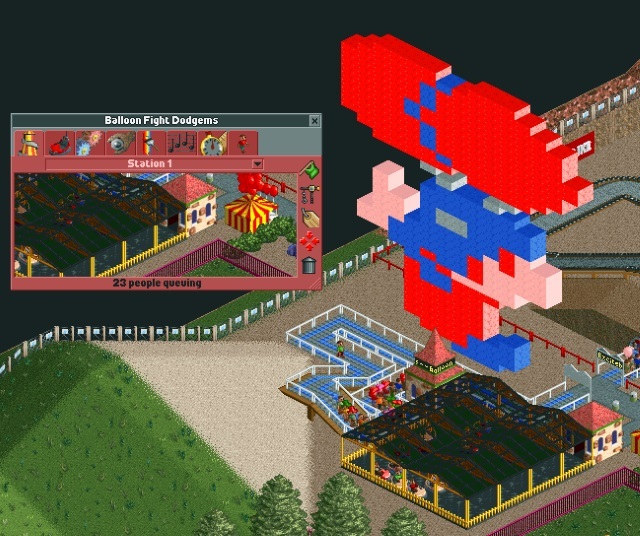 Opposite the thrills of Excitebike, we have Balloon Fight Dodgems, complete with giant pixel art Balloon Fight Man (not sure if he actually has a name). It was more of split-second/sudden strike of inspiration and coupling, and the idea seems to have turned out rather well. 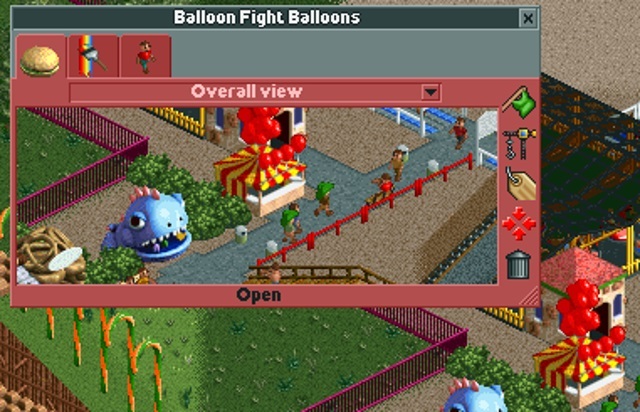 Of course, the ride wouldn't be complete with out Balloon Fight Balloons being sold nearby! This little NES homage needed one more thing though: Duck Hunt Toys! I finally found some buoys to place around the Wave Race jet skis, so now it's looking a little better. 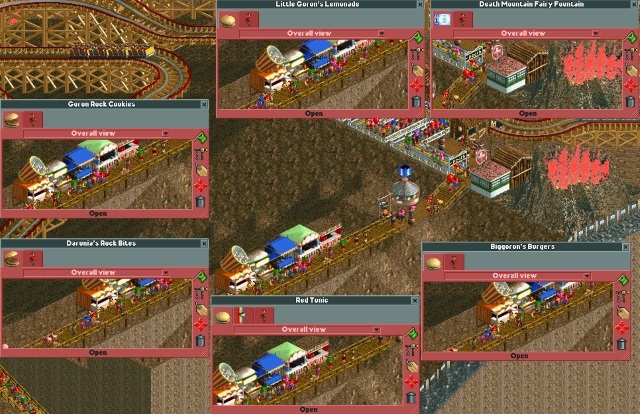 Tragically, 36 guests have died. 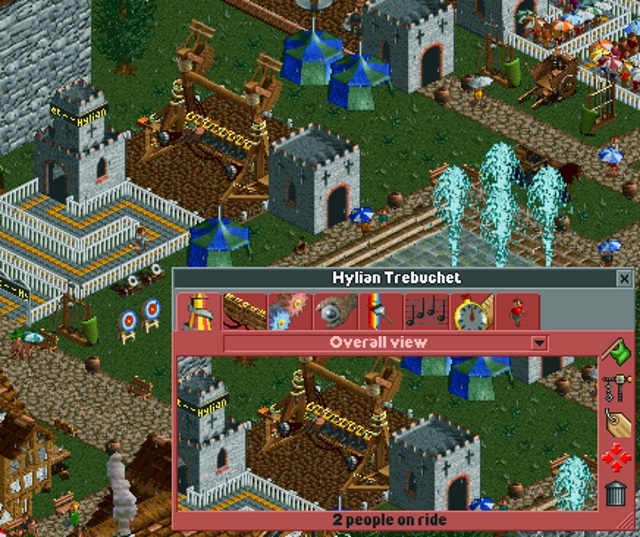 Just goes to show that even fantasy parks face real world theme park problems and tragic events. I have since fixed the problem by extending the braking area underground, as I have identified the event to have been a brake failure, and the second train ran into the back of the first train and exploded (I believe). 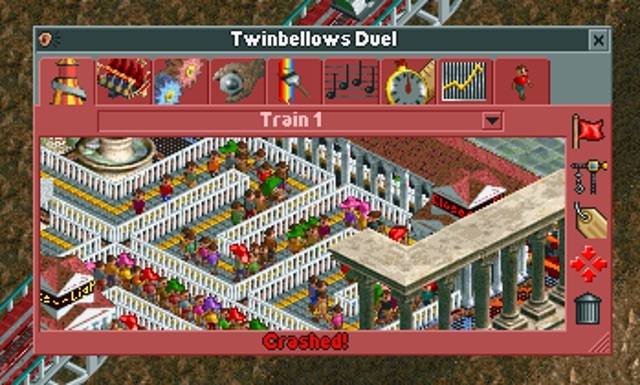 Twinbellows Duel will certainly suffer with less guests wanting to go on it now, but hopefully over time that will change. Anyway, with that out of the way, yes, we are on the penultimate update! 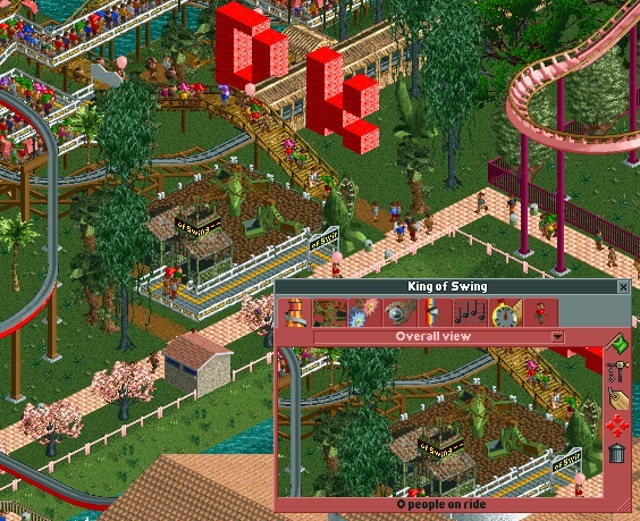 Park Progress Overview #8 certainly shows how full and diverse Nintendo Land is now! 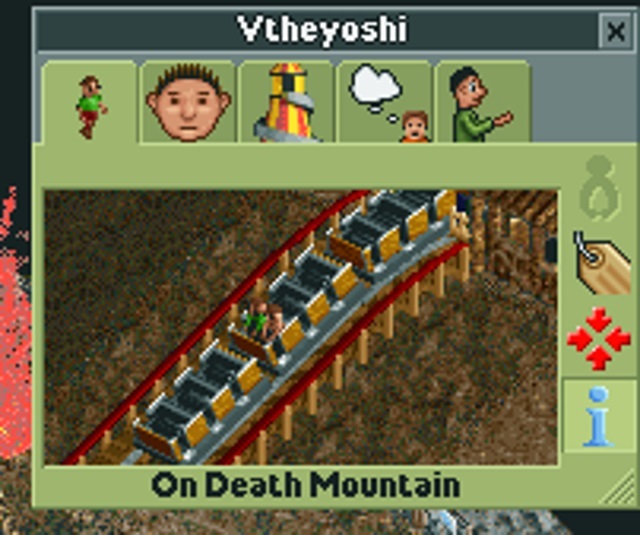 This Death Mountain rollercoaster! 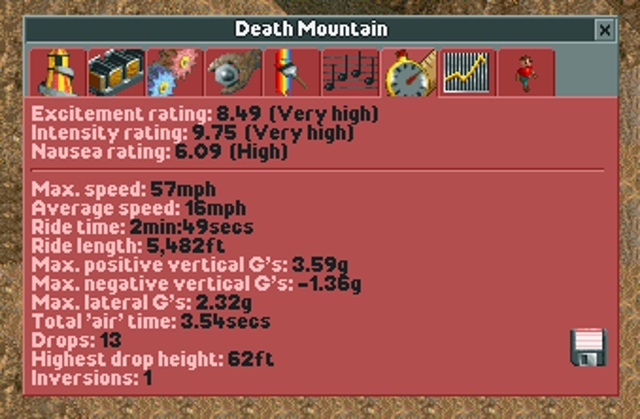 Simply named "Death Mountain" to mimic Disney's own Space and Thunder Mountain rollercoasters. The stats were pretty difficult to work with, being Extreme in intensity for a while. 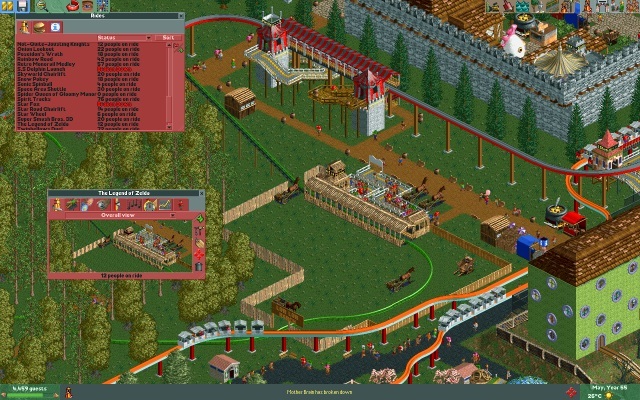 But, I managed to reduce that, and I think it may be one of the longer rollercoasters in the park. 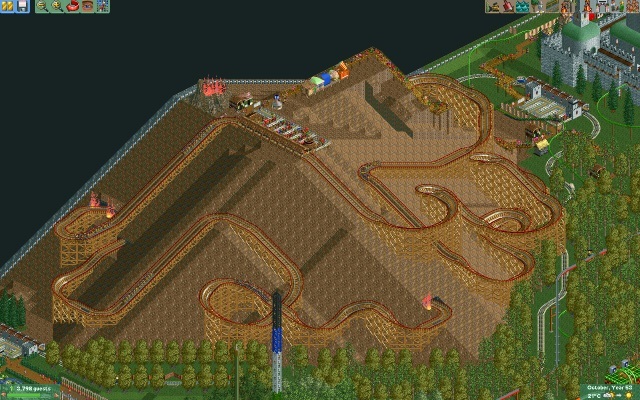 Of course, in true Death Mountain fashion, the coaster does go underground at several points, and if this were a real ride in the real Nintendo theme park, it would obviously have Goron City on the inside. We also have plenty of shops at the top of the mountain, including: Goron Rock Cookies, Little Goron's Lemonade, Biggoron's Burgers, Darunia's Rock Bites, Death Mountain Fairy Fountain, and for the first time ever, a named first aid station, simply called Red Potions. 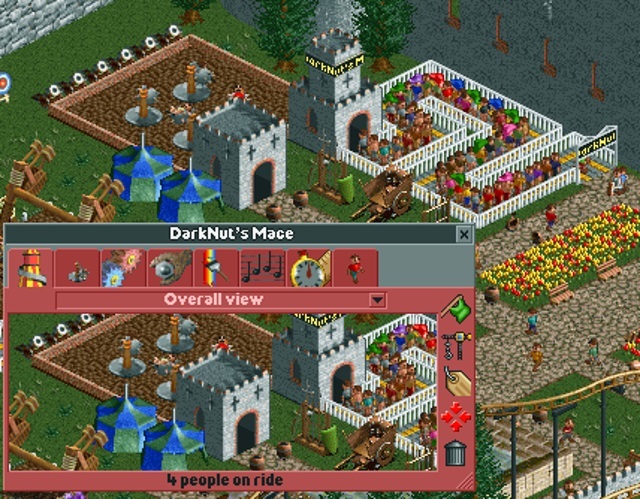 And to top off this update, as per Bix's request, I chopped down some of the trees blocking the big DK sign, and decided to plonk down a twister ride, aptly named King of Swing, to fill in the little space available left over. 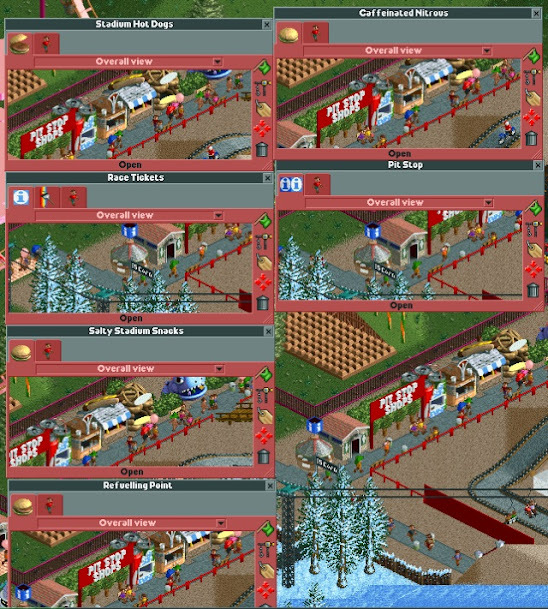 Can't wait for the news reports and the board of directors closing the park until further notice. 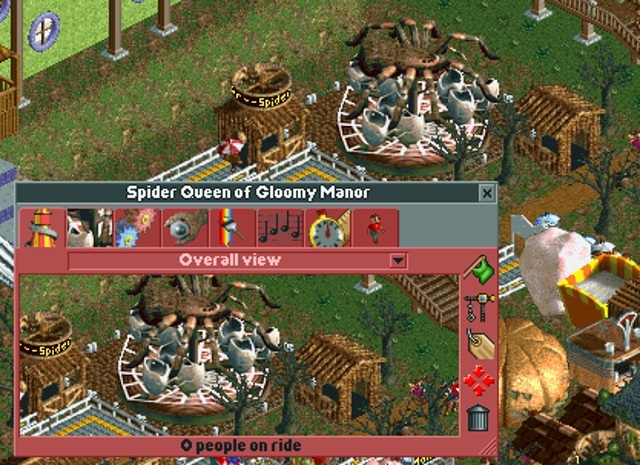 That new rollercoaster is really awesome. 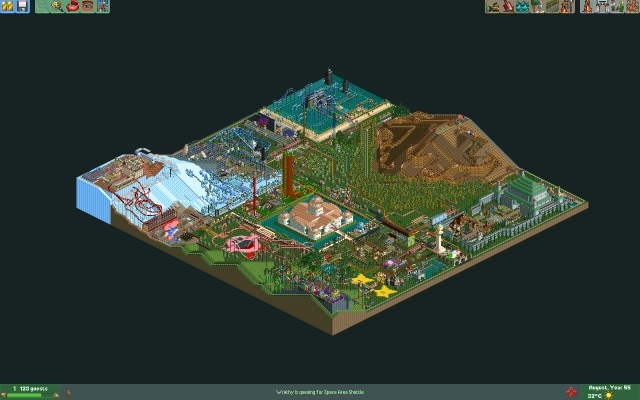 It's a pity that RCT2 is isometric, as I'd love to walk around this place Thrillville style. 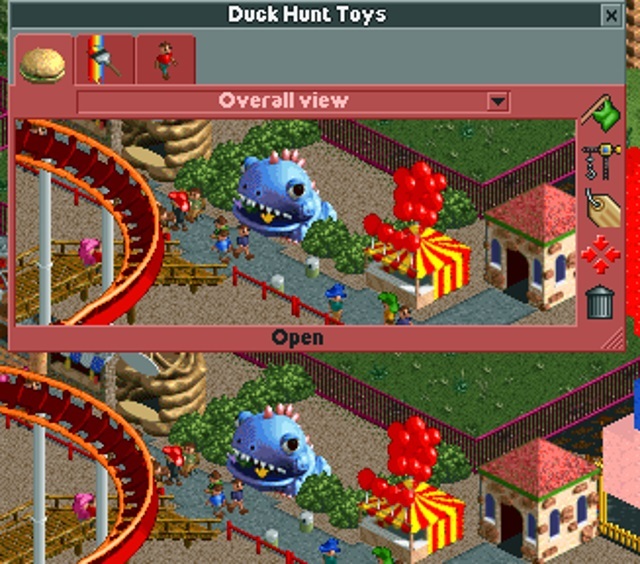 Oh wait... Coaster Park Tycoon. 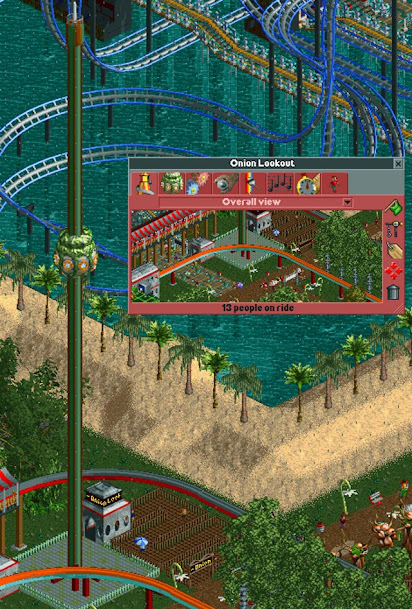 Frontier Developments. 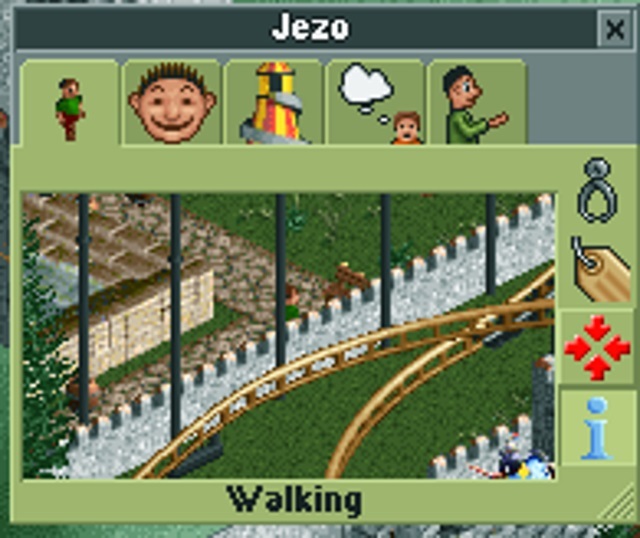 The creators of the latest Zoo Tycoon. 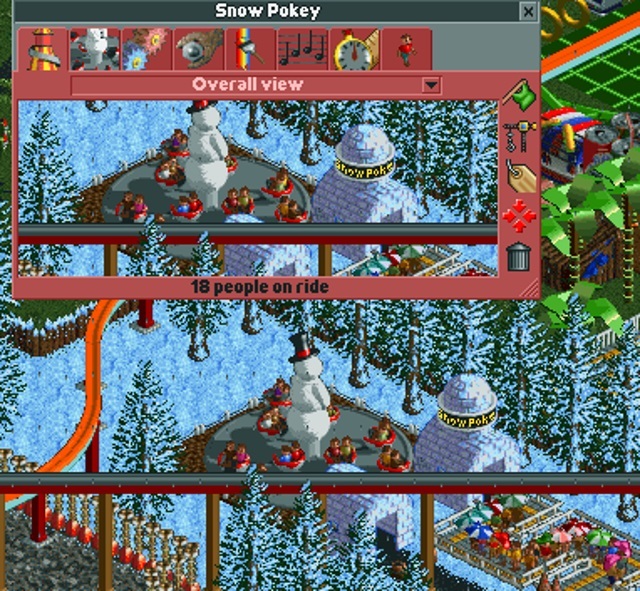 COASTER PARK TYCOON HAS TO BE A CROSS BETWEEN RCT AND THRILLVILLE AND IT WILL BE THE BEST GAME EVER! Ahem. Yes. 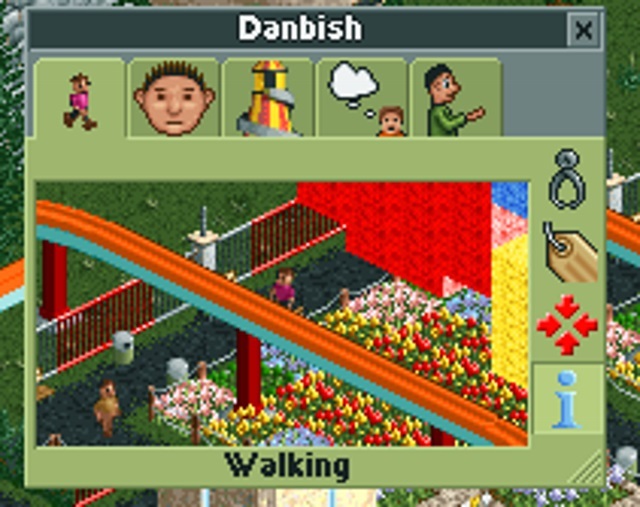 This park is really great, and it's been fun seeing it come together in all these updates. 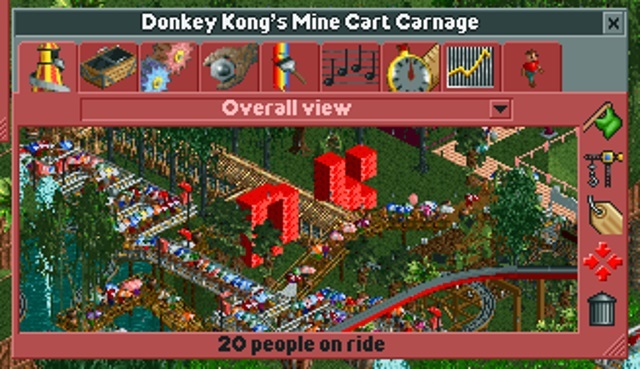 The Donkey Kong Mine Cart ride is now Donkey Kong's Mine Cart Carnage, named after the first mine cart level of the original Donkey Kong Country game. 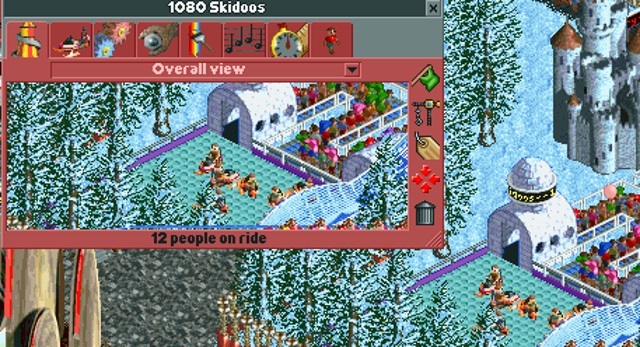 The skidoo dodgems are now simply 1080 Skidoos. Trying to get that 1080 Snowboarding reference in there, but now it's more extreme! The Epona horse ride adventure thing is all encapsulated in it's new name, The Legend of Zelda! This was the little surprise I eluded to earlier for all of you have been a part of this project. 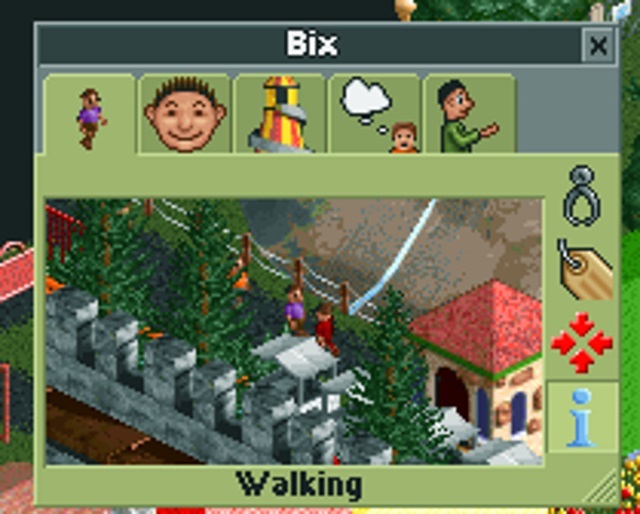 Now there is a part of each and every one of you in the park! And I have tabs on all of you to see who is up to what, I just hope no one leaves too soon. But that's not all! 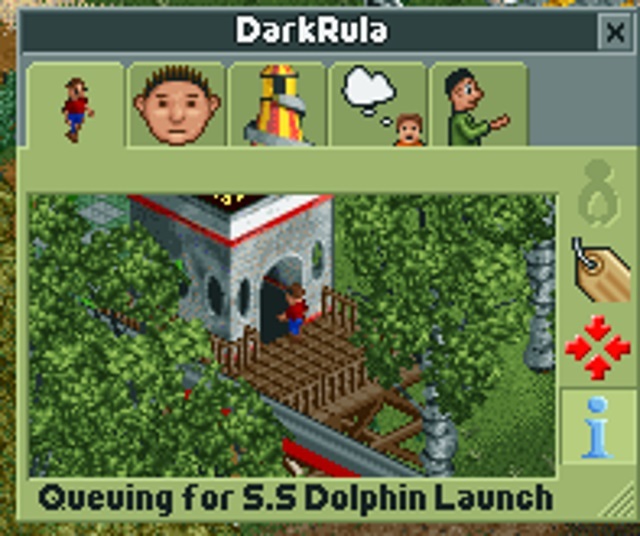 The SONM Logo now adorns the park entrance, showing guests that this was the Nintendo Land Theme Park that SONM built. And so there we have it. I want to thank you all for supporting this silly little project of mine. 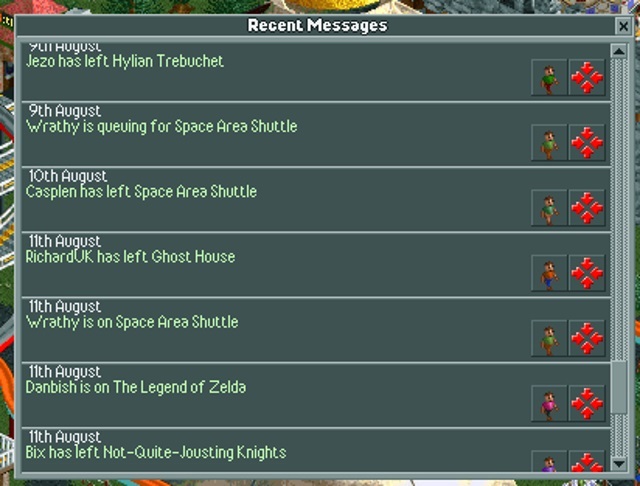 It mainly started just to pass the time throughout the summer holidays, but became an incredible creative experience in which I am so happy you all enjoyed seeing grow and contributed to. It has certainly boosted my confidence in sharing future creative projects, whatever they may be. 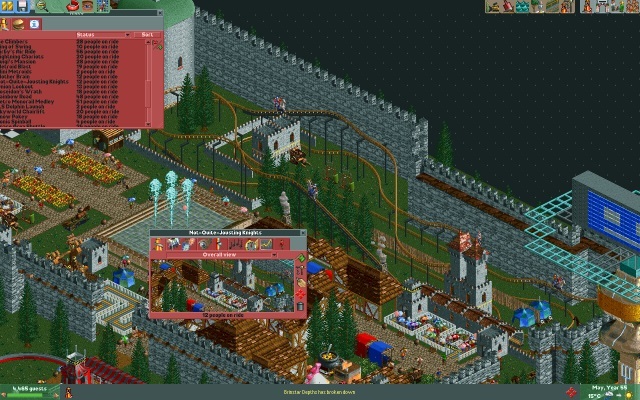 Sad to see it come to an end, but the final park looks absolutely brilliant! 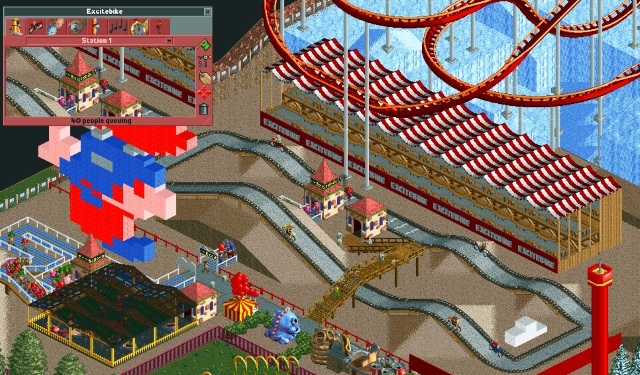 It's exactly what a Nintendo theme park should be like - I tried to design one years ago with a friend and it came nowhere near to the brilliance of this. Great idea with the tribute - and thanks for giving me one. 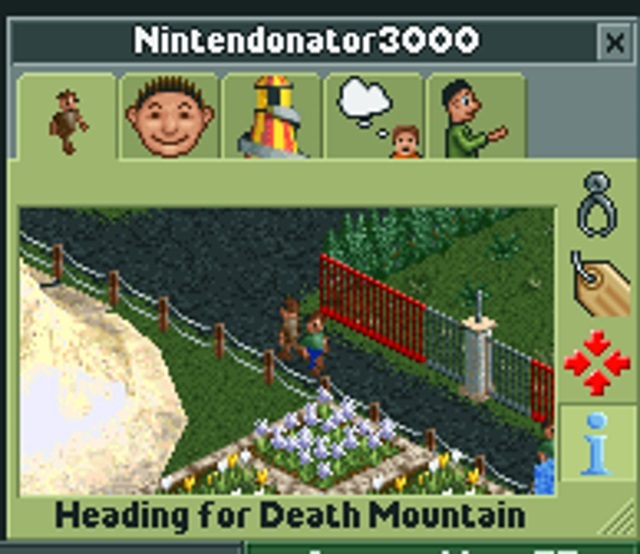 Quite appropriate I'm heading to death mountain as that is somewhere I'd definitely prioritise visiting. Most of all congratulations to you for finally finishing it and thanks for the all the hard work you put into making it! This was absolutely brilliant SupaWaluigi, and the end result is fantastic! Super cool that you put us all in as guests too. OrangeRakoon wrote: This was absolutely brilliant SupaWaluigi, and the end result is fantastic! 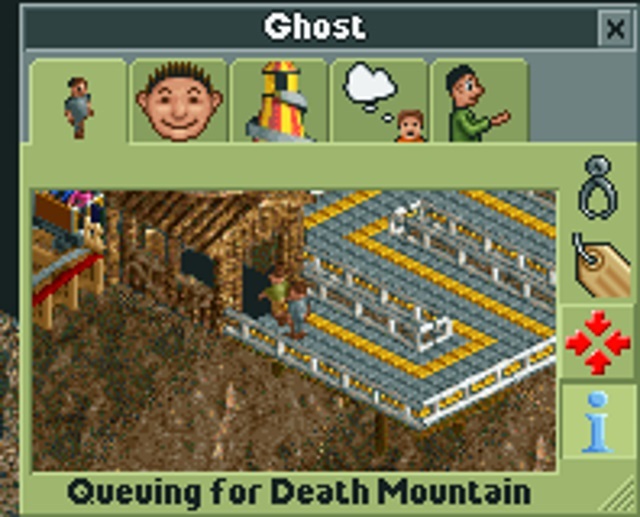 Super cool that you put us all in as guests too. A thread for the archives once everyone has commented and stuff, perhaps? This has definitely been worth it, and to be immortalised in the park [at least until I leave it - I hope I don't] is just brilliant. This whole thing has been brilliant. And you should be proud to have made it. If you ever do any other projects in the future, I'll be sure to have a look in. This was a fab idea, it's been super fun watching the park develop and grow. Great job! This was pretty awesome to follow start to finish, and the end result looks great. Good job. 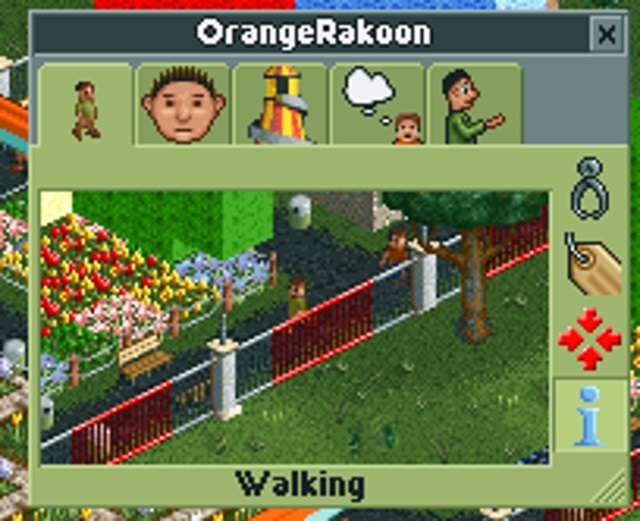 I may not have been commenting much but I have been following the development of your park and I have to say it is simply incredible, the dedication you've put in is outstanding. 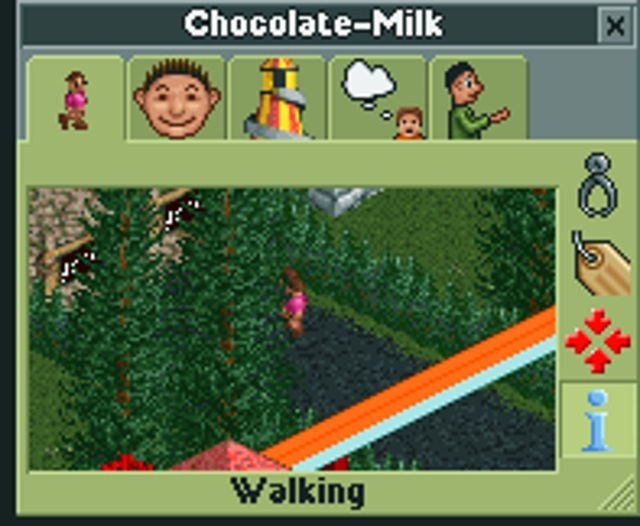 I especially love the Balloon Ride guy flying over the NES section and the inclusion of us SOMN'ers is a very nice touch. 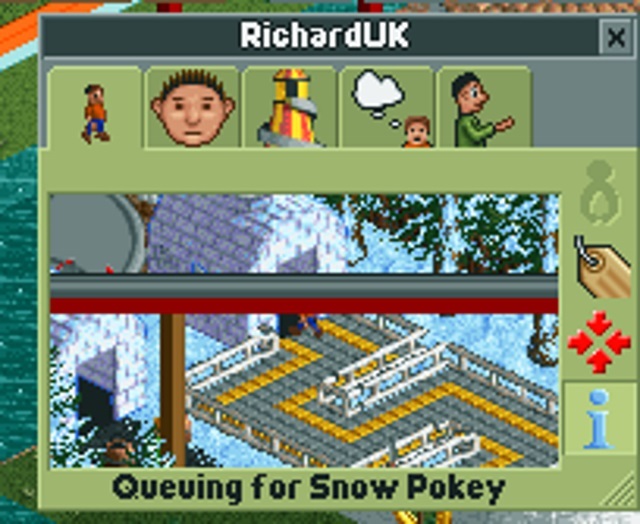 I tip my hat to you sir, its just a shame that your theme park is a virtual one. At least I'm there in electronic spirit and hopefully I won't leave! 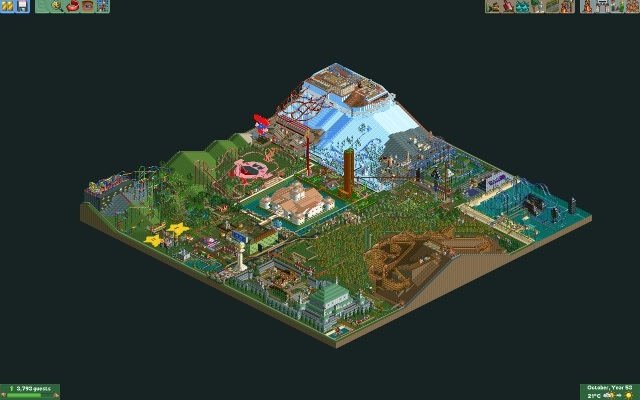 Can you post a full screenshot of the entire park without resizing it for the forum, so we can see more detail? 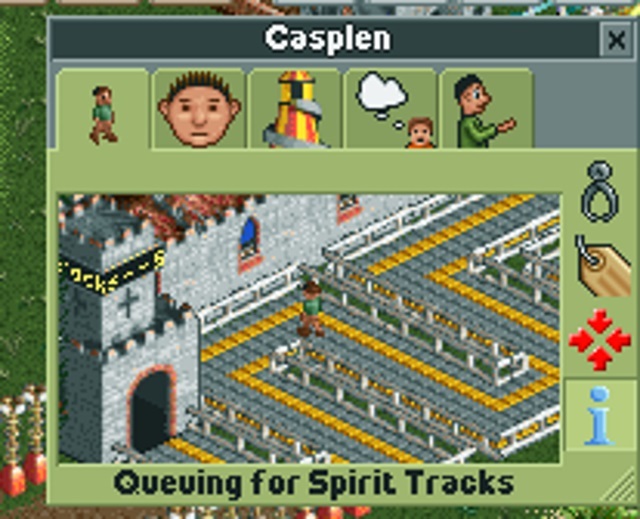 Everything you could ever need for that theme park is in this thread. Now that you have the ideas, get to work!! 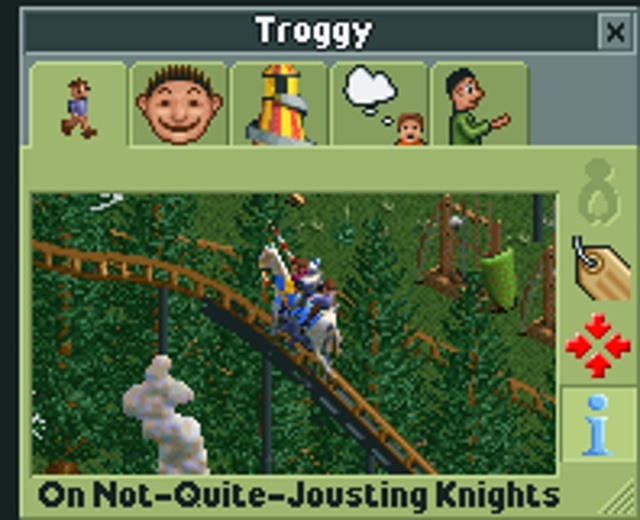 Really really great, and of course I'd try out the Not-Quite Jousting Knights. Hope I get on all the rollercoasters before I leave (or at least DK and Big Blue).